July 25th, AWS “Summer Heat 6” at American Legion Post #335, South Gate. Despite a WWE House Show running in the same time frame at Staples Center, Bart was able to draw a very large crowd into the legion hall. 1 – Famous B successfully defended the Lightweight title over Sonjay Dutt. Very strong, back and forth opener that saw B end it with the “I Believe I Can Fly” Swanton Bomb. Another great back-and-forth action that ended with Che tossing Espiritu onto a Tito Superkick for the pin. This was probably the most technical match on the card, with plenty of mat wrestling holds. Nicole put Rosa in a Triangle Submission hold that Rosa was unable to get out of, resulting in the submission win. Another even match that Ryan ended with a 5-Strike Combo, followed by the Perfect Circle. A very even match, in which the crowd was really into. The drapes from a previous legion hall event, that were hanging over the ring, started to sag too low during the match, so Referee Rick Knox tore them down as an obvious safety measure. Brian couldn’t put Willie away with a Discus Lariat, nor was he able to hit Weapon X. Willie, however, couldn’t Brian away with a Chocolate Thunderbomb, and had to hit a stunning strike on Cage, to then a Frog Splash, for the pin. Short but effective ladies match off of the intermission. Very even, up to where Raze hit a German Suplex on Candice, and rolled it into her “Soul Eater” Spear for the pin. Mariachi Loco gave a great showing, despite having to use a pad over his ailing left shoulder. Obviously, that became a target for Tyler in another even match, before nailing a pair of Elbow Strikes for the pin. Very even match between these two high-profile ladies. When both women exchanged headbutts, it knocked them out just enough for Referee Justin Borden to rule it a Double-KO. It was not a surprise decision, given the match stipulation, but the crowd definitely wanted to see more of these two great ladies in the ring. All three tag teams pretty much had equal share in the match, complete with plenty of out-of-the-ring brawling, and PPRay obviously gunning for two members of “The Crew” in LU. B-Boy & Cholo found the right opportunity, with B-Boy landing the Shining Wizard, leading to a title-clinching double-pin. Overall, a very strong card, and the crowd kept the energy going for as much as possible. Bart can use all the support he can get, with 2 shows left in the year–maybe for quite a long time. If you can’t make it to BoLA on the final weekend of August, then the next AWS show on 8/29 is a viable alternative, with some other big names on the indie scene currently scheduled for the show. 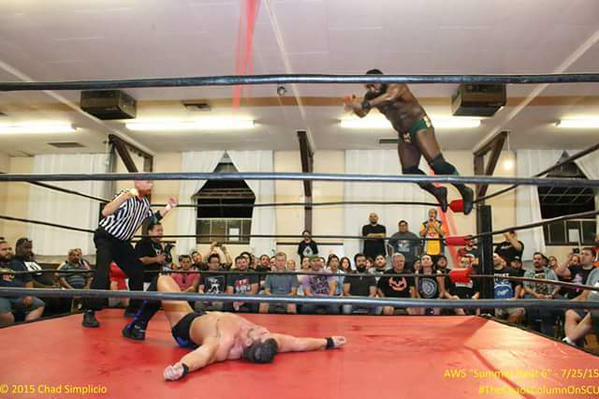 1 Comment on "A Recap of AWS “Summer Heat 6” – 7/25/15"
We’re almost the same on our top matches. I have Famous B vs Sonjay Dutt, Willie Mack vs Brian Cage and Little Cholo/B-Boy vs PPRay vs Reno Scum as my top three, in no particular order.